Arnavutköy is a historic neighborhood in Istanbul, famous for its wooden Ottoman mansions and fish restaurants as well as the prestigious Robert College campus with its centennial buildings. 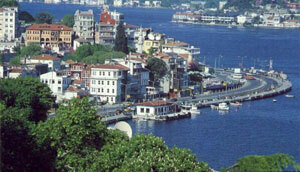 It is part of the Beşiktaş district of Istanbul, and lies on the European side of the Bosporus. Arnavutköy has previously been home to the Ottoman Strawberry, a less juicy and small kind than the usual strawberries found throughout Turkey. To date some strawberry fields survive in the inland of the district and every spring local groceries are pillaged by strawberry lovers. The population, in a publication of the Şirket-i Hayriye (Istanbul Ferryboat Company), written just before the First World War, was given as 493 Turks and Muslims in 168 households, and 5973 Greeks in 975 households. The population was predominantly Jewish for most of Arnavutköy's history, but many Jews moved away after the great Arnavutköy fire of 1877. In history the village has been known, subsequently, as Hestai, Promotu, and Anaplus. The Byzantine church of Ayios Mihael, built by Constantine, used to be here. It was pulled down and its stones used to build the castle of Rumeli Hisarı.